#fridayreads take me away is a weekly meme to celebrate the start of the weekend and the glorious day of reading whatever the heck you want. Want to know more? Read the original post where I explain why you should join in with what you read on the weekend. Want to write your own post? *Steal* my button. Have your own #fridayreads take me away post? Link up below! Happy reading. You know, to me, the ultimate read for a Friday accomplishes two goals: a. it takes me away (thus, the meme title) and b. it requires little in the way of thought. Not that I don’t love thinking. I do. [See yesterday’s review of Galore.] However, Friday afternoon and evening I selfishly claim as “me” time. Last Friday I stuck to my guns and took my copy of Real Simple and had my pedicure. This week is Good Friday, so I will be at church with the fam in the afternoon. Plus, work is still progressing on the bookshelves, but YOU, I hope, will be reading. So what do I recommend you read this week? To be perfectly honest, I have an ulterior motive. I really really want you to read Leviathan. I read this and reviewed it here way back in October. Westerfeld creates an alternative history to World War I, full of steam-powered machines and biologically-altered creatures, who assist in war. It’s steampunk – set in the Victorian era, it’s fantasy at its most believable. Leviathan is about a young man destined for great things and a young woman prohibited from dreaming of great things because of her gender. It is also about how each goes about forging his or her own way, regardless of society. Fantastic fun. And I really want you to read it because I plan on reading…. I am almost embarrassed to tell you how long I have been intending to read this sequel. Leviathan is a real cliffhanger, but I guess since I had to wait (all of two weeks) for Behemoth to come out, my excitement waned. However, this is a perfect book for a Friday, and I am really anxious to start it and re-enter the lives of Deryn and Alek. Plus, if you read the first, I can tell you what I think about the second, and it will be a whole thing. Ya know? So get cracking. What are you up to this beautiful day, and what are you reading for Friday Reads? I’d love to hear all about it and check out your blog! This entry was posted in #fridayreads take me away, fiction, fun read, historical, picky, travel and tagged Behemoth, Friday Reads, Galore, Leviathan, Michael Crummey, Real Simple, Scott Westerfeld, steampunk on April 22, 2011 by pickygirl. A festival of books? It's a festivus for the rest of us! Friday afternoon, I ditched the office, the pup, and Beaumont, Texas to go with my parents to the Texas Book Festival in Austin, Texas. We went last year and had such a great time, we decided it had to be an annual event. I had plans, people, big plans: I had my panels mapped out. I booked a hotel close to the site with breakfast included so we wouldn’t have to run around hunting for a Starbucks. My dad, on the other hand, had no clue. Yet somehow he made it to seven panels, while I only made it to four. Ah, beginner’s luck. The four panels I did make it to? Incredible. Plus, I got to meet up with some other Texas book bloggers and end the moratorium on book buying. Throw in a little honky-tonkin, and you’re looking at one exhausted, but pleased picky girl. Fantastic. Funny. Charming. Scott Westerfeld rocked – plain and simple. He really gave the sort of lecture I strive to give to my students – informative, humorous, practical, and interesting. He talked a bit about his series Uglies, but as I cannot speak to those books, I’ll focus on what I was there for – Leviathan and Behemoth. Westerfeld spoke about where the idea for the books came from. He has a blog, and his fans post art inspired by his books. When he found the Japanese version of his first series had drawings, he was a bit taken aback; his fans were jealous. As he said (and I paraphrase), there’s nothing like an oppressed teenager…. Westerfeld pondered why we, as Americans, avoid illustrations in adult books. Why do we reserve illustrations for the young and then take them away at a certain point? Why do we assume illustrations narrow the imagination instead of expanding it? So with Leviathan, he found illustrator Keith Thompson, and they collaborated quite nicely. He says the illustrations “allow for alternate story lines” and that if you look closely, the illustrator works these in carefully. The challenge, though, is making the story active enough – “with illustrations, characters have to move around, so the drawings can change.” Otherwise, the scenes become repetitive. He also had to think differently in terms of setting the stage. Keith would send him sketches, lacking a couple characters Westerfeld had in the scene. When asked about this decision, Keith would tell him it looked too crowded. So Westerfeld revised. In between Saturday’s panels, I met up with some great Texas book bloggers, including Iliana at bookgirl’s nightstand who encouraged me to get into book blogging. It was really great to put faces to the names although since I only knew what Amanda looked like, I was a bit nervous. Thankfully, I spotted the group pretty quickly, and I had a great time chatting with Iliana, Carin, Karen, Trish, Debbie, and Amanda. Jason, Amanda’s husband, was gracious enough to take our photos (please notice how antisocial we are; we are standing like a foot away from each other). 😉 All in all, it was great to meet everyone, and I can’t wait for next year to do it again. Stay tuned for a wrap-up of Sunday’s awesome panels!!! This entry was posted in american literature, blogging, design, fiction, just because, library, miscellany, picky, travel and tagged Austin, Behemoth, honky tonk, Julia Glass, Lance Letscher, Leviathan, Scott Westerfeld, Texas, Texas Book Festival, The Perfect Machine, The Widower's Tale on October 19, 2010 by pickygirl. 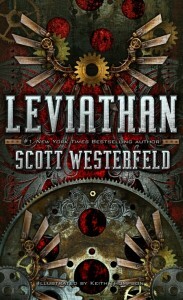 A few weeks ago, at the library, I saw a really interesting book cover: Leviathan by Scott Westerfeld. I didn’t pick it up as I have been insanely busy, and my book bag was already overflowing. However, when I saw the Texas Book Festival site and got so excited about the author list, I knew I had to go back and pick up Leviathan as Scott Westerfeld will be in Austin in October! There are also other bloggers whose opinions I respect (like Amanda at The Zen Leaf) who rave about Westerfeld’s series, The Uglies. Leviathan is set during World War I, and much of it is historically accurate. Westerfeld’s genius, though, is in changing how these events take place, and I was fascinated pretty much from page one. I’ve learned since reading this, the technique is called ‘steampunk.’* The major dividing line between the two sides is not simply political. Instead, the Germans, Austrians, and Russians are Clankers – they create and depend on huge metal, industrial machines to defend themselves. Alek, the son of the assassinated archduke, is thrust from a cush life with simple defense training in a mechanical Stormwalker into defending himself and several servants bound to protect him. Alek’s questionable lineage makes him a threat to the forces wanting to take the place of the archduke. Running from his own people, Alek is forced to look at life in a much different way, made unbelievably clear to him when he comes into contact with the outside world. The British, not yet in the fight, believe themselves to be more enlightened. Termed the Darwinists, the British rely on new crossbred animals to defend themselves. Scientists look to animals to find strengths and abilities and then use theseÂ to create super animals, such as the leviathan (have I mentioned my love affair with this word? I love it). Filled with hydrogen by other smaller working animals, the leviathan is an air ship, similar to a blimp. Deryn Sharp, a young woman whose father was obsessed with flight, is determined to be in the British Air Service. Young women are not allowed, however, and Deryn must disguise herself and prove she is capable enough to man the ship. When Leviathan comes under attack and crashes in Switzerland near Alek’s secret hiding place, both Alek and Deryn come face to face and forge an unlikely alliance, as the two sides with distinct ideologies (Clankers and Darwinists) are distrustful and skeptical of one another. This story was fascinating to me: the Darwinist animals and their purposes were interesting (although the implications were somewhat troubling), but the descriptions of them were beautiful as well. The book is illustrated with beautiful work by Keith Thompson and though I loved the illustrations, Westerfeld’s words truly built these creatures in my mind. The mindset of the two sides was evident and understandable – the Darwinists are seen as intervening where they should not be, creating “beasties” for the sole purpose of exploitation. The Clankers are seen as wasteful and unimaginative. Both sides have excellent points, which I think will further be explored in the sequel. Which brings me to: THE SEQUEL!! I didn’t know anything about this book when I picked it up and certainly didn’t realize there was a sequel, scheduled to appear in October, until I got to the end – a total cliffhanger. When I went in search of the sequel, I realized it wasn’t out yet and was more than a little miffed that Westerfeld would leave me in such a bind. In other words, I LOVED this book. It is an excellent, fun read, and I would recommend it to adults and children alike. How old Darwin figured out how to weave new species from old, pulling out the tiny threads of life and tangling together under a microscope. How evolution had squeezed a copy of Derynâ€™s own life chain into every cell of her body. How umpteen different beasties made up the Leviathan â€“ from microscopic hydrogen-farting bacteria in its belly to the great harnessed whale. How the airships creatures, like the rest of Nature, were always struggling amongst themselves in messy, snarling equilibrium. Deryn makes no apologies for her preferences and passions, but she certainly gets a kick out of one of Leviathan’s passengers. Dr. Barlow, a female relative of Darwin, makes a surprise appearance on the airship, shocking Deryn, who thus far has only seen that a woman must hide her true identity to do what she loves. Dr. Barlow is stubborn and intelligent and a leader in her field. It was exciting to see such strong female characters, even if one is in disguise. I trust Westerfeld will address this further as the series moves along. Leviathan is an action novel, fun for all ages; pick it up, and watch for my review of Behemoth, the next book of the series. This entry was posted in fiction, fun read, historical, library, sci fi and tagged Clankers, Darwinists, Leviathan, library, Scott Westerfeld, steampunk, Texas Book Festival, World War I on September 20, 2010 by pickygirl.